Another player is being rude to me through private message. What should I do? First, don’t answer them. You may be sanctioned if your comments don’t follow the site rules. Report the message directly to a moderator by clicking on the ‘Report’ button in the message box. A pop-up window will appear so you can confirm reporting the message or cancel in case of an error. - If another player asks for your log-in or private information. - Pornographic content (pics, links, texts, messages, etc.). - Chain messages or Spam. - Any content you deem to be inappropriate. Think to blacklist the player in question so they cannot contact you again. Any abuse of this tool will not go without punishment. THINK BEFORE YOU CLICK! Remember, if you speak back to the player inappropriately, you run the risk of being sanctioned as well. Someone asked for my login information, what should I do? Never communicate your information with anyone, especially another player. Your game email, ID and password are for your eyes only. Report the message immediately so a member of the moderation team can sanction the concerned player. IT IS FORBIDDEN TO ASK ANOTHER PLAYER FOR THEIR LOGIN INFORMATION. ANY PLAYER WHO TRIES TO GAIN ACCESS TO ANOTHER PLAYER’S ACCOUNT WILL BE SANCTIONED. My Account has been pirated! What should I do? Never share your password or login information with anyone, not even an admin/moderator! * A maximum amount of information about the account that isn’t visible publicly on the game. Any request for help with a lost account that doesn’t include all of the requested information will not be treated. Without this information, we cannot help you with the account. /!\ If your account was reset, know that we cannot CANNOT undo this action! If an address is already used, we will search for multiple accounts and block any suspicious accounts and suspend the account recuperation process for the main account for an undetermined time. Completing this form will reset your password and send an email to the email address associated with your game account, including your new/temporary password. If after 48 hours, you have not received the email, please contact the support team using the form below. [GAME] I’m encountering issues while playing the game on my mobile device’s browser! What should I do? As of now, Eldarya is a game developed for the web, therefore on a computer. We suggest that you play the game on your computer’s browser while waiting for the site to be optimized for mobile devices! I share my computer/IP address with other players, what should I do? To avoid the deletion of these accounts, contact a moderator to inform them of the situation. Please provide them with the name of the concerned accounts. If accepted, the accounts will be added to a list of authorized multiple accounts. What are cache and cookies? How do I empty them? Cache and cookies are diverse pieces of information stored on your computer through your navigator while you browse the internet. They can often be the cause of different blockages or display issues in the game. What is a web cache? A cache is used for the temporary storage of web documents, pages and images. When should I clear my cache and cookies? The cache and cookies can be emptied/cleared when you want. We suggest that you do this regularly, at least twice a month. To clear these elements, each navigator has its own method. Visit this page for more information on clearing your cache, history and other browser data on Google Chrome. Visit this page for more information on clearing your browsing history options on Internet Explorer. Visit this page for more information on clearing your private data on Opera. *Note: On Firefox you must clear the cache and cookies separately. How do I add someone to my Blacklist? To blacklist someone, go to their profile page. 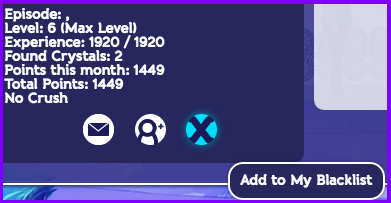 In the player information section, you will find an icon with the name Blacklist (by hovering over with your mouse, you will see “add to my blacklist”). You must then click on it and they will be added to your blacklist automatically. You can also go through the Messages area. On the page "My contacts" do a search through "Find other players Username". 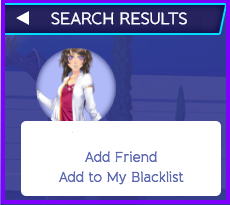 Once you have found the player, you will need to hover over their avatar icon to make the "add to my blacklist" option appear.